In his first visit to the United States as Foreign Minister, Taro Kono paid his respects to those Japanese Americans who were killed in action during World War II by placing a wreath at the Japanese American Memorial to Patriotism. 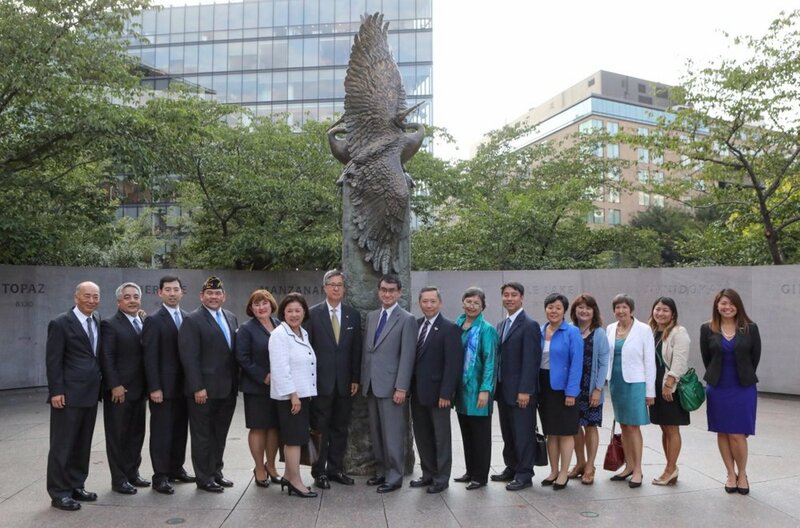 Foreign Minister Kono, who has been a long-time supporter and friend to many Japanese Americans, said that he wanted to send a message to Japanese Americans that he values their friendship and support in deepening the relations between Japan and the US. Foreign Minister Kono was given a tour by National Japanese American Memorial Foundation (NJAMF) Board Members Doug Ichiuji and John Tobe. In addition, he was greeted by representatives of the Japanese American Citizens League, the Japanese American Veterans Association and the US-Japan Council. Ichiuji and Tobe explained to Kono that the mission of the NJAMF was to educate and provide public awareness about the incarceration of Japanese Americans by the US government during WWII and to ensure that this injustice would not be repeated. Kono remarked that he fully supported this principle and would work with NJAMF to ensure that the civil rights and civil liberties of all people would be protected. Foreign Minister Kono, who was appointed Foreign Minister by Prime Minister Abe on August 3, had traveled to Washington, DC to participate in the first meeting of the U.S.-Japan Security Consultative Committee (“2+2”) under the Trump Administration, and also held his first formal meeting with Secretary of State Rex Tillerson and Defense Secretary James Mattis.